The Taber bantam Rebels started the Southern Alberta Minor Football Association season off on the right foot on the weekend. 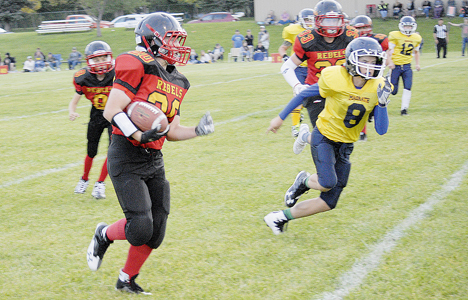 In a Saturday-night home game against the Magrath Wolverines, Taber posted an impressive 42-0. The Rebels put up 328 yards of total offence in the contest, but it didn’t all come easy. Taber switched to an outside running game, which featured slotback Aiden O’Connor, who rushed for 79 yards and added three touchdowns. O’Connor’s efforts were part of a 228-yard effort for Taber’s ground game, as Kole Reynolds added 41 yards and a touchdown, and Liam Knutson chipped in with 37 yards and another score. Taber’s passing game also clicked for 100 yards, as Kyler James collected 60 yards and Mason Werewka added another 40 yards. Defensively, O’Connor led the way with 11 tackles, while Cohen Broadbent had seven stops and a recovered fumble, which he took to the house for a touchdown. Evan Rabusic collected seven tackles, while Reynolds, Brennan Abela and Nathan Keeping had three tackles each. Knutson and Noah Mouland each had interceptions, while Broadbent and Werewka both forced Magrath fumbles. On special teams, the Rebels went 6-for-6 on extra points, as Abela hit four and Werewka connected on both of his attempts.